The Castelli Women's Aero Race jersey saves 2 watts and sheds 40 grams over its predecessor, delivering advanced aerodynamic performance. The new and improved Velocity fabric makes up the front of the jersey, using a featherlight blend of fibers that channel air over your shoulders across its dimpled surface. The sleeves and back continue the dimpling with the 3D mesh fabric, wicking moisture from your skin and keeping you cool through the hardest efforts. 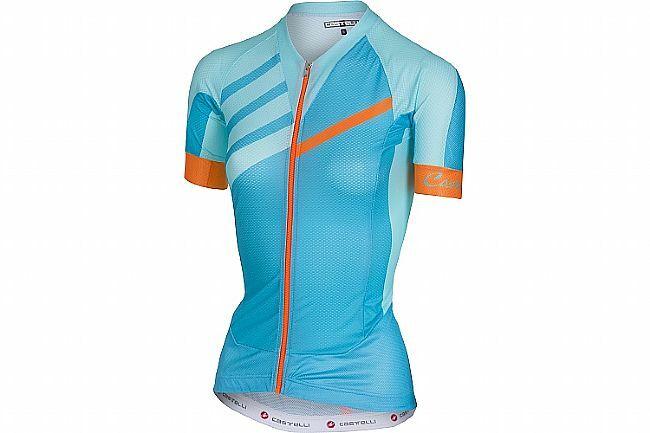 Not only is this jersey incredibly fast, it's incredibly lightweight at just 103 grams.